I was in the cages for 7.5 hours today and that wasn’t enough! They had to drag me out kicking and screaming (well almost). Today was a great way to end our trip. It started off bright and early in the surface cages with “Mickey” giving us all a great show as he breached as soon as he showed up and greedily kept going (and getting most of) the bait. 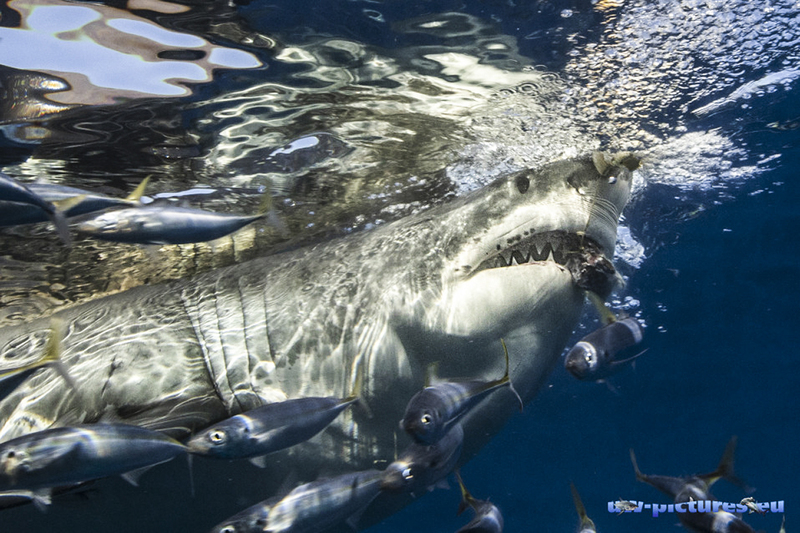 No shortage of sharks – always multiples – the rest of the day (as with the other days) and today “Lucy” finally showed with her personal entourage of pilot fish. Ended the day with “Ropey,” “Dotty,” and “Lexi” all still circling the cages. It was an amazing time all around; I really could stay down there all day! I thought this was going to be a once in a lifetime trip, however I now believe once is not enough! A very big thank you to the sharks who welcomed us into their habitat, and the wonderful crew for making it such an enjoyable experience. 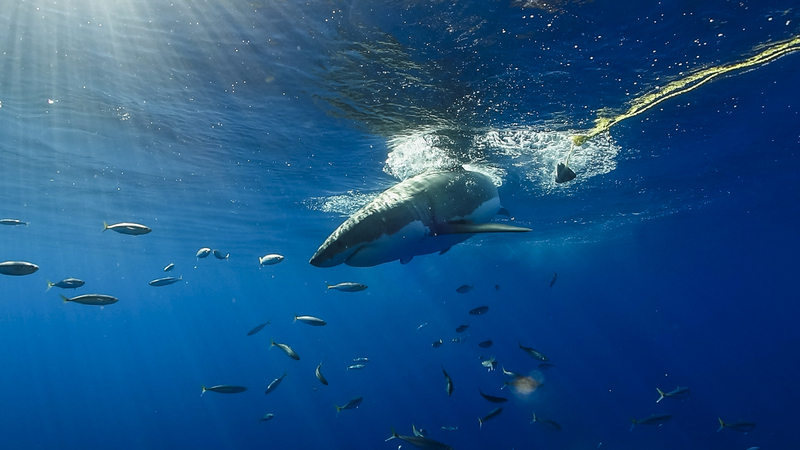 I have dreamed of seeing great whites for pretty much my entire life; and I would have been happy if, of the three days of diving, I had only seen one great white. I am beyond ecstatic to have seen multiple sharks on every dive, some dives, 5 sharks at one time. 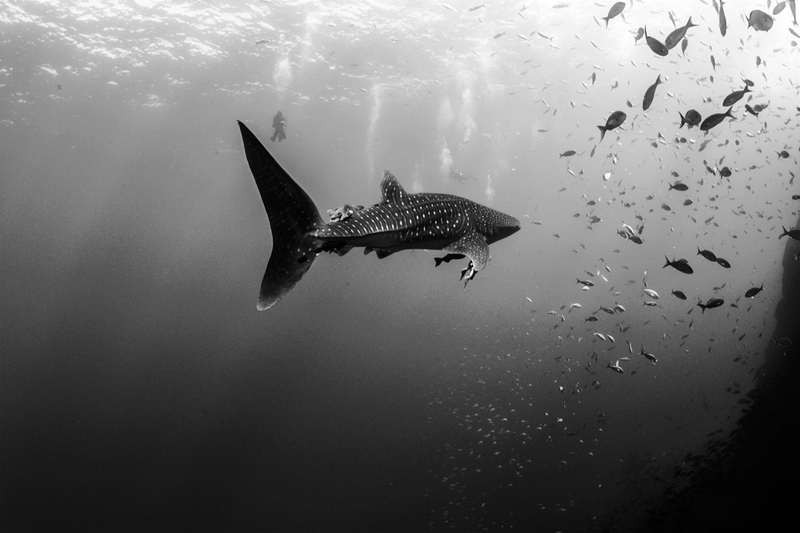 You don’t need to be a certified diver to enjoy this trip as there is plenty of action on the surface cages all day long. We saw 3 massive females, “Lucy,” “Scarlett” and “Dotty.” “Dotty” being approx. 18 ft. Watching the big females go for the bait is a trip, you can experience how their age has made them wise when the hunt as they bolt from the depth and give no warning to the shark wranglers. Just an awesome experience overall, and will be back to experience it all over again, with new sharks! 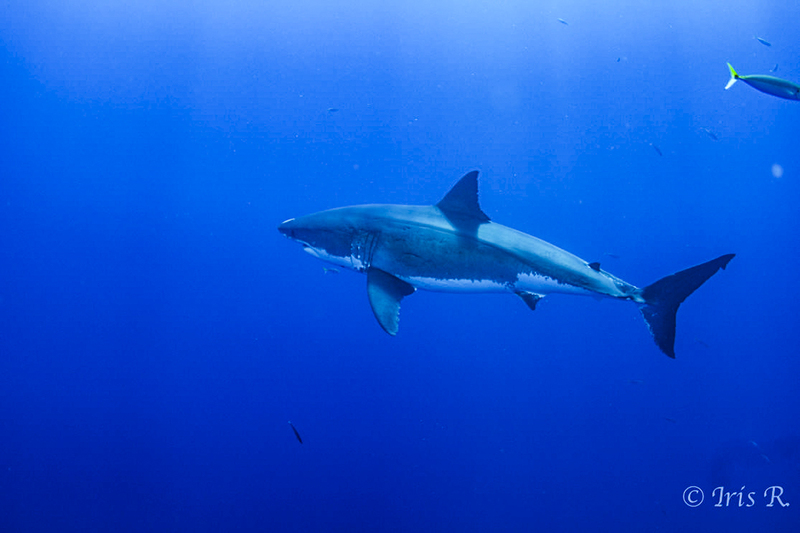 Guadalupe Island on the Nautilus Explorer: Beautiful weather, great crew, lots of very impressive sharks! A great trip with many sensational impressions! 6:30 am first dive, sharks breaching straight off the bat. We were in the water all day and saw multiple sharks every time, at times up to 6, for a total of 15-20 individual sharks per day. Big Mommas! The second day was even better than the first! The crew has been wonderful, anticipating our every need and exceeding expectations at every chance, keeping us entertained and in good hands. The food is excellent, and the ship is definitely luxurious. Can’t wait for tomorrow…..and to come back again! Very thankful! A great trip with the one of the most majestic animals in the world. Thank you for your good energy. What a great second day of diving. Lots and lots of sharks….up to 5 at one time around the cages. All the divemasters have been more than helpful and they know you by name. Everyone on the crew takes the time to get to know you by name. What a great group to dive with and the sharks are absolutely incredible. This trip was a massive tick for my ‘Wish List’ & was super excited on the build up before. Every morning I was in the cage at 6.30am when the ‘Whites’ were coming in for breakfast feed, they never disappointed & on the last morning “Mickey” put on an awesome show for us, breaching over & over again for the catch. 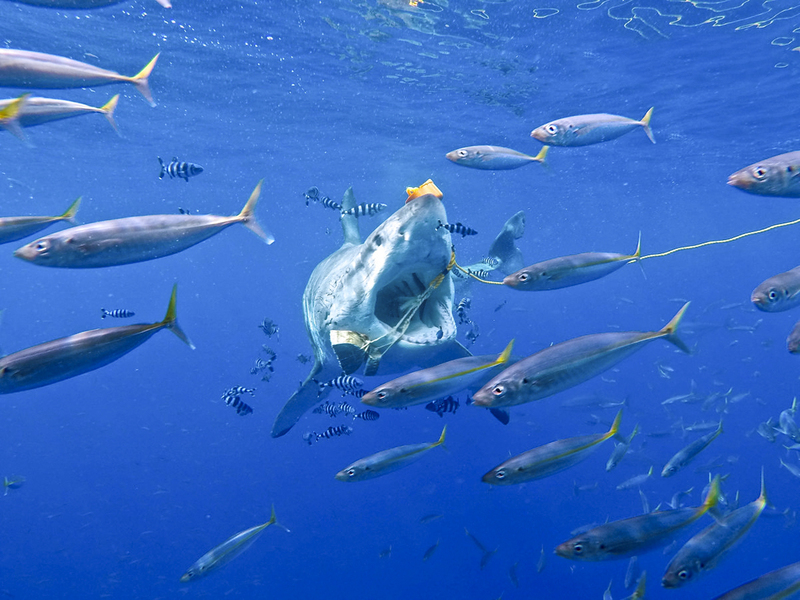 “Lucy” also turned up with her harem of Pilot Fish which was a sight to see, she commanded her presence. Overall, we saw about 14 different sharks & I dived for 21hrs 58mins over the 3 days, forgot about eating, and didn’t feel cold as your adrenal was pumping all day & when in the cages you were 100% focused on the excitement of seeing these magnificent majestic sharks. I bow to you ‘The Great White Shark’. This is my second year coming to Guadalupe Island and I can honestly say that I am now a lifer! Consistently amazing service by the crew, delicious food, great new lifelong friends and EPIC sharks! Thank you again for a trip of a lifetime which is now a tradition for both myself and the friends that I have met in these last 2 years! Five of us are already planning to be back together next year and we know 100% that that trip will be as perfect as this one. Thank you so much Nautilus Belle Amie for the laughter, the amazement, the mind blowing great white action, and the memories! See you all next year! I have been going on the Nautilus boats since 2008. 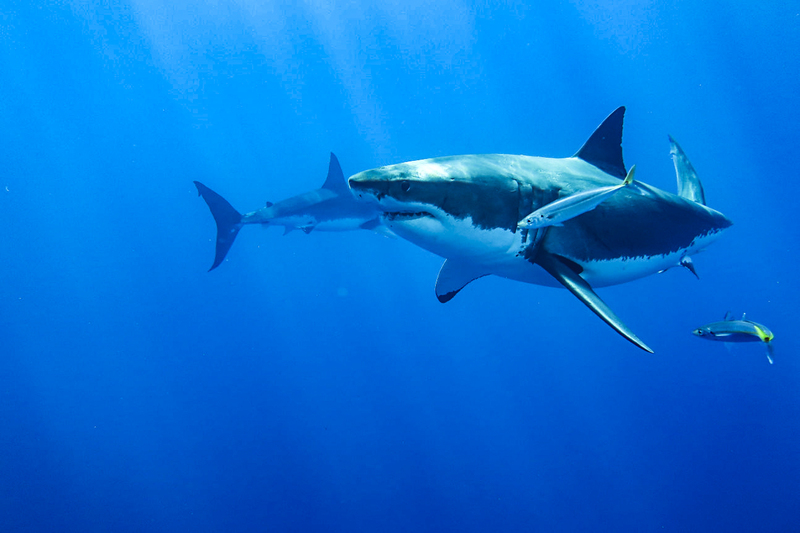 I have been to Guadalupe Island 5 times and this morning I had so many encounters with white sharks it blew my mind. Not only were all of us screaming with delight but we all felt we were on one of the safest boats around. The crew has made this trip so enjoyable we are all smiling throughout the day. And this is just the first day! First trip to Guadalupe. So many sharks I didn’t know where to look first. The wranglers did a great job. The food has been so great, we feel like we’re getting fattened for the sharks! Great group of folks from all four corners make the trip an extra special adventure. My first trip to Guadalupe as I had to cancel my trip last year. I am so happy to be here today. The staff is wonderful and very helpful, the place is lovely and there are lots of great whites! I hope to be able to come back. It is a great trip with nice people. Such an incredible experience! This was my first dive trip in many years and my first trip ever to Guadalupe. To be able to be in the water with great white sharks was amazing. There were so many of them and they’re so beautiful to watch. The trip was made even more special thanks to the professional and knowledgeable crew – safety and FUN were made the top priorities for all guests. I plan to come back! Words will fail to describe the feeling of a lifelong dream coming true. The sharks were beautiful and awe-inspiring. All I had hoped for and more. The whole crew made me feel so at home. I was blown away. They created an atmosphere on board which was fun and congenial while maintaining total professionalism. This kind of accomplishment can only be achieved by people who genuinely care about the enjoyment and well-being of every guest. What a remarkable group of people! Shark rodeo in Isla Guadalupe! We have had 20+ different sharks in 3 days – it was incredible. Thanks to the amazing crew from the Nautilus Explorer for this unforgettable trip. Amazing first day! Surrounded by so many beautiful sharks! The crew is wonderful! So helpful and friendly! All of the food has been delicious and beyond expectations! 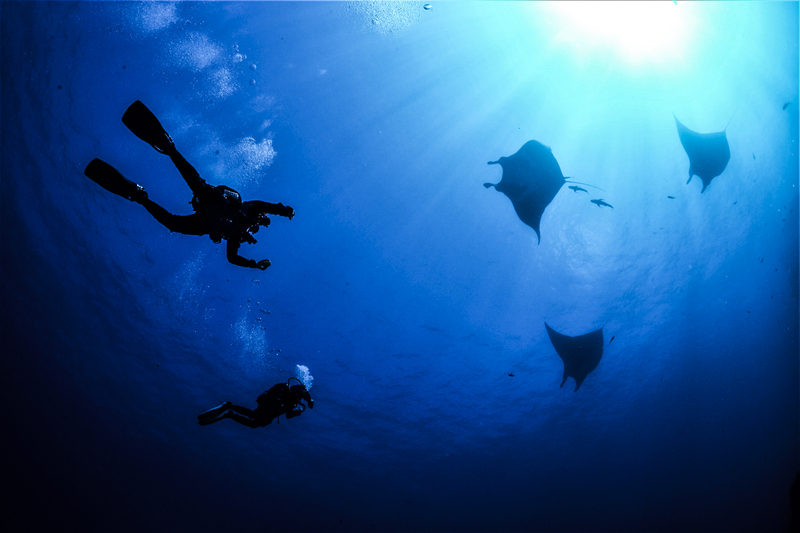 It’s breathtaking sharing water with such beautiful creatures! Sharks, especially whites, have always been my favorite animal. Being able to see them is unreal! The first day did not disappoint! 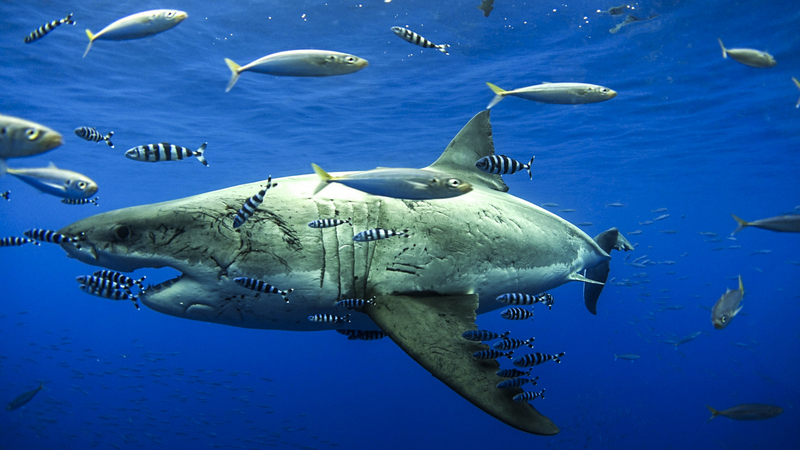 Amazing number of great white sharks! At end of the day, there were some HUGE females. Can’t wait for tomorrow. The crew is a class act and very enthusiastic about their jobs. The first day was amazing! There were a lot of sharks both at the surface cages and the submersible cages. Everyone was in awe of the massive females that showed up toward the end of the day. The crew is top notch, from the hostesses to the divemasters. Can’t wait to see what the rest of the trip brings! This was my first opportunity to see these animals in the ocean. The grace, strength, size and beauty were all striking. The interaction between the baitfish, mackrel, tuna, occasional wahoo and the much more massive sharks was also fantastic to observe. Having the underwater time to see the sharks swim, and apparently make decisions on whether or not to go for a bait, and to see how often they don’t go for it also something that changes the way a first time shark diver thinks about great white behavior. It also enhances the experience of seeing the sharks at the surface, since you have a much better idea of what they are doing and how they are acting. The clear skies, clear protected water, and the abundance of sea life, and the back drop of Guadalupe Island’s sheer arid face make this a surreal experience. The ship and crew have ensured that it is a pleasant one too. Today was a great day in the cages, the sharks were very interactive. They swam in close range to the cages. I had the incredibly fascinating opportunity to meet eye-to-eye with a couple of these beasts. The crew always made us feel safe. They thoroughly demonstrate that they know what that they are doing and place the guests first in everything, from dining to the water. The island is gorgeous and provides a calming sensation where you can forget about any of your worries from home. I feel very blessed that I was able to experience something so breathtaking. The sharks are incredible, just as imagined! They come within inches of the cages. Many of the sharks breached out of the water to take the bait. The crew is very friendly and accommodating and the food is fantastic! I highly recommend this trip to everyone. A truly memorable experience. My first time on a shark cage dive trip, I would do this trip 1000 times. This crew was the best, they will work with whatever needs you have. I will return to this boat any time.